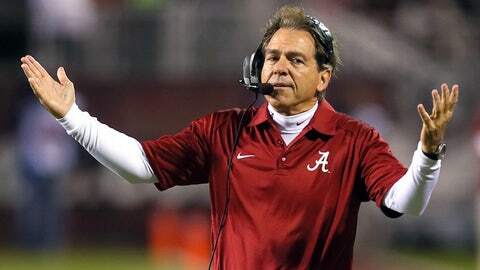 Alabama head coach Nick Saban is no doubt an SEC supporter. Nick Saban is keeping busy today even though he isn’t coaching in the SEC title game. And he’s out there campaigning for his conference. The Alabama coach appeared on ESPN as an analyst and was asked what he thought about a one-loss SEC team going to the BCS National Championship Game even with two other major-conference unbeaten teams out there. Of course, this scenario could play out if Auburn (or Missouri, though Saban was asked specifically about Auburn) wins today and Florida State and Ohio State also win their conference championship games later Saturday and stay undefeated. Saban defended Auburn, saying: "Well, I really do believe that since Auburn beat us, if they win the SEC Championship Game, they certainly deserve the opportunity to play in the national championship game. That’s what I think. That’s not to take anything away from anyone else, but that’s just how I feel relative to our circumstance in our league." Still, if Florida State beats Duke in the ACC title game and Ohio State takes care of Michigan State, it’s hard to envision an SEC squad leapfrogging either one. Then again, this is the BCS we’re talking about here, so expect the unexpected.